These wall clocks celebrate your time zone through recessed silhouettes. 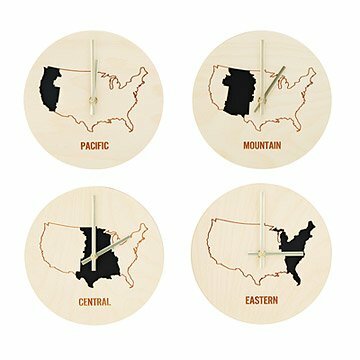 Inspired by the multiple clocks of classic news rooms (each set to a different time zone), these wall clocks show Eastern, Central, Mountain, or Pacific time through elegantly abstract recessed spaces, laser engraved into baltic birch. The easy-to-hang timekeepers with brass hands and a lacquer finish make smart accents for a Midwest kitchen, Rockies retreat, West Coast bungalow, or round-the-clock office in the city. Made in the USA. Dust lightly with a feather brush.